"Sorry, but it is impossible to even like you, Lee Israel"
One of the greatest challenges writers can experience is finding an audience for the subject matter that they find fascinating. 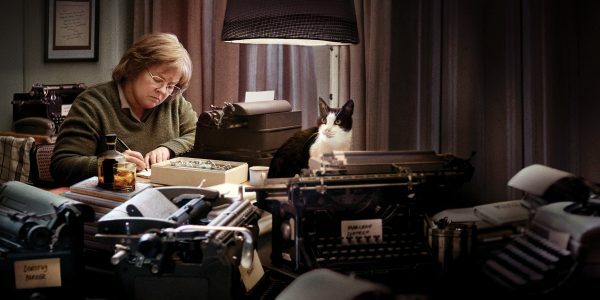 Lee Israel (Melissa McCarthy) was an American biographer who had moderate success for her work throughout the 70s and 80s, which included her work making it on the New York Times Best Sellers List. After writing a controversial biography of Estée Lauder, Lee experienced a fall in reputation and her publisher failed to back her new work, a biography of Fanny Brice. As the author struggled through alcoholism, financial stress and failed relationships, she attempts to get the research done on her proposed work. While leafing through a book on Brice, she found a letter written by the famed actress and singer. After doing some research on the subject of personal correspondence from famous writers, playwrights, and actors, Lee sold the letter for a modest amount. Then after selling a letter she had received from Katherine Hepburn and making substantially more money, an idea formed that could lead her out of financial hardship. With the help of Jack Hock (Richard E. Grant), the pair worked to manufacture forged letters and then sell them to collectors. The team managed to sell over 400 different letters throughout the early 90s until one collector questioned the validity of one of the letters from Noel Coward that was too personal to be believed. This caused Israel to be blacklisted amongst collectors and forced her to go to more drastic measures to maintain her income stream. By Jack’s recommendation she begins to forge letters and under the guise of research she switches out the forgeries with the originals that are stored in research libraries. This all goes to plan, except the FBI has been made aware of Israel and Hock’s work and eventually is able to catch them at their criminal activity. 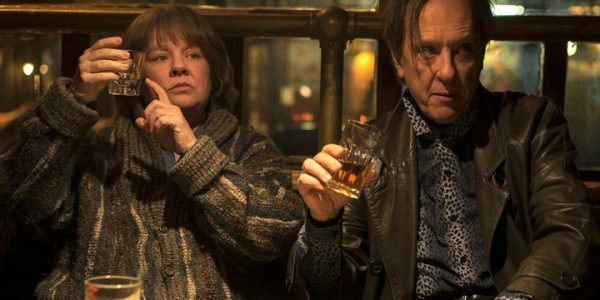 The biggest challenge for director Marielle Heller (The Diary of a Teenage Girl) is to get audiences to empathise with her lead character. During one scene involving an altercation between the author and her literary agent played wonderfully by Jane Curtin, Lee is told that the failure of her career was due to her personal communication skills and an aversion to playing the game of publishing. Leonore Israel was known for being caustic, abrasive and foul-mouthed, which was shown in this cinematic portrayal and allows for little to no sympathy. Heller tries to humanise her character by providing a romantic relationship with a local bookseller named Anna (Dolly Wells), but this proves that Lee has no ability to care for anyone besides herself. Even though McCarthy does a transformative change to embody the role and gives one of the best performances of her career, there is little to like about her character. The story is a compelling look at the human condition and has all of the earmarks of a great film, but it is difficult to support anything about Israel or Hock. What could win over fans would be the strength of the screenplay and the unique aspects of this tale of deception. As a work of art, Heller has brought together great performances and good writing to deliver a good film. Reminiscent of watching a train wreck, it is hard to avert your eyes, but ultimately leads to a tragic waste of talent and a life.